Jamshedpur: Maelstrom- the flagship event of XLRI Adventure and Nature Club, returned for its second edition on 7th January 2018. It was a day full of thrilling activities and fun games. The day kicked off with Bungee Basketball and Rifle Shooting which attracted students in huge crowds. Paintball and Meltdown saw enthusiastic participation from dozens of teams. All-Terrain Vehicle thrilled the more adventurous of the lot. 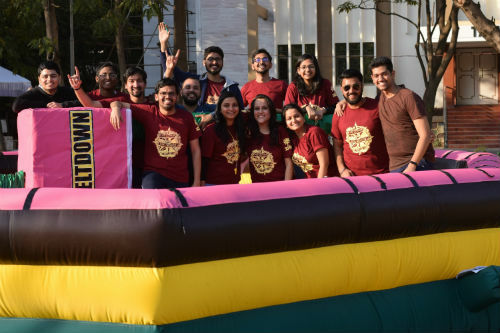 Over 500 students, faculty and staff thronged the football ground to partake in the fun. “At Maelstrom this year, we have endeavoured to colour the canvas as vividly as possible with copious shades of energy and enthusiasm. We are excited to provide our fellow batch mates with this opportunity to unwind and stimulate their thrill-seeking zeal”, commented Pranav Pal Singh, the secretary of XLANC. Partners including TSAF, IOCL and Double Down were thanked by XLANC for their support.